At the end of the year, the media reflects on the past year's highlights. Looking back at Goose Pond Sanctuary, the highlight for 2016 was the breeding bird point count project that Heather Inzalaco, UW-Madison Environmental Studies, conducted for her master’s project. Heather can identify over 200 species by call and did outstanding work on this project. Our goal for many years was to learn the species and numbers of birds breeding at Goose Pond Sanctuary. Heather conducted two rounds of point counts at our 660 acre sanctuary (1,542 pairs) and at the Manthe’s 65 acre farm (121 pairs) located east of Goose Pond Road and north of the “east” pond, and now restored to prairie. She also surveyed Erstad Prairie and Otsego Marsh. Heather developed the point count protocol that included 10 minute stops 77 yards apart, in all habitats except for open water. We added data from our waterfowl pair counts and other observations including birds around the residences. Heather also prepared detailed maps for all parcels. Males were counted as pairs. If Heather observed 3 pairs and 2 singing males it was counted as five pairs. The highest number from the first or second counts was counted for each survey block. Species like the sedge wren, dickcissel, and American goldfinch had higher numbers on the second count. This summer’s survey provides a baseline for future breeding bird surveys. 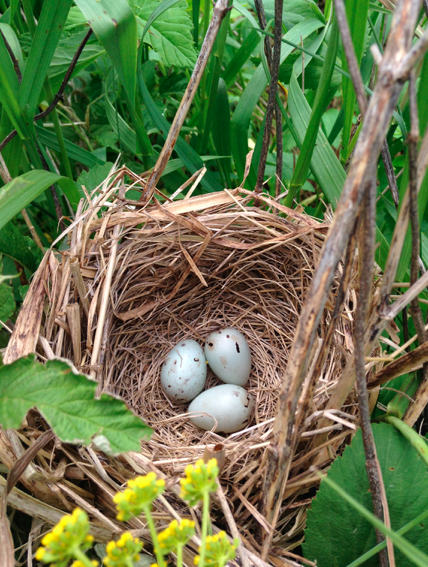 Heather also recorded species that she confirmed nesting (nest with eggs, feeding young, or fledged young are in bold) and we also added confirmations from atlas work in 2015 and 2016. If a nest was found photos were taken to document the nest for the Breeding Bird Atlas II project. Species of Greatest Conservation Need (SGCN) are designated by the Department of Natural Resources. Geese and ducks included Canada geese 1 pair, mallard 93, blue-winged teal 7, northern shoveler 3, green-winged teal 4, hooded merganser 1, and ruddy duck 1. Female mallards usually return to where they were hatched and with very successful nesting many females are returning. A brood of hooded mergansers jumped from a nest box at Sue Ames Prairie. Wetland birds included sandhill crane 2, marsh wren 7, yellow warbler 14, and swamp sparrow 15. The nesting pair of cranes on the west pond raised one young. Shrub, fence row, savanna and woodland species included wild turkey 6, mourning dove 8, northern flicker 1, alder flycatcher 7, willow flycatcher (SGCN) 15, eastern kingbird 6, warbling vireo 3, American robin 39, gray catbird 16, brown thrasher (SGCN) 11, field sparrow (SGCN) 1, northern cardinal 5, indigo bunting 3, orchard oriole 1, and Baltimore oriole 2. There may have been more than 8 pairs of mourning doves since Sara Kehrli, Columbia County Wildlife Biologist, banded 88 doves at Goose Pond this summer. Species found mainly around the residences, in nest boxes, and in miscellaneous habitats included killdeer 10, rock pigeon 2, American kestrel 6, eastern phoebe 1, tree swallow 64, barn swallow 40, house wren 11, eastern bluebird 2, European starling 2, chipping sparrow 3, common grackle 8, house finch 1, and house sparrow 8. The 40 pair of barn swallows nested in our barn at the Kampen Road residence. Over 460 acres of restored prairie were surveyed and this large acreage accounts for the bulk of the birds. Grassland birds found included ring-necked pheasant 28, northern harrier (SGNC) 2, sedge wrens 62, common yellowthroat 212, clay-colored sparrow 128, savanna sparrow 1, song sparrow 302, dickcissel (SCGN) 23, red-winged blackbird 365, eastern meadowlark (SCGN) 46, brown-headed cowbird 17, and American goldfinch 47. This is the first time that two harrier pairs nested at Goose Pond and both fledged young. All the dickcissels were found at the 80-acre Ankenbrandt Prairie. One of our favorite birds that are increasing in numbers is the eastern meadowlark, and we enjoy hearing its call. Almost 50 years have passed since Madison Audubon acquired the first parcel at Goose Pond, a gift to our feathered friends that keeps on giving. The birds thank all of our members, donors, volunteers, and interns who have been involved with land acquisition and habitat restoration at Goose Pond. Thanks to Heather for all her research work.